Britain's Rebecca Adlington bounced back from her 800m freestyle flop to claim gold in the 400m freestyle at the European Championships in Budapest. The Olympic champion, seventh in the 800m, overtook France's Ophelie Cyriell Etienne over the last 100m for victory. Another Briton, Jo Jackson, was fifth. 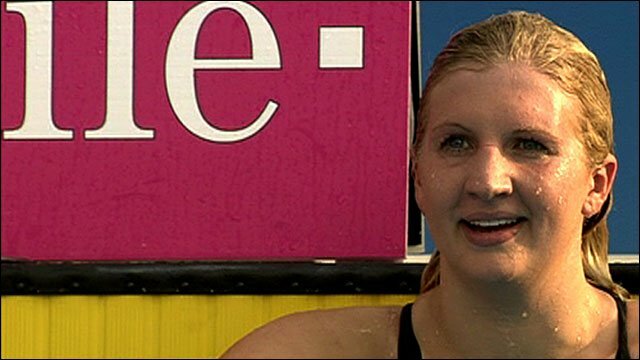 "That meant so much to me," a delighted Adlington told BBC Sport. Adlington's gold was one of five British medals on the final day as GB extended their haul to 18. With six golds, silvers and bronzes, GB finished a highly encouraging third in the medals table behind Russia (7-4-1) and table-toppers France (8-7-6). 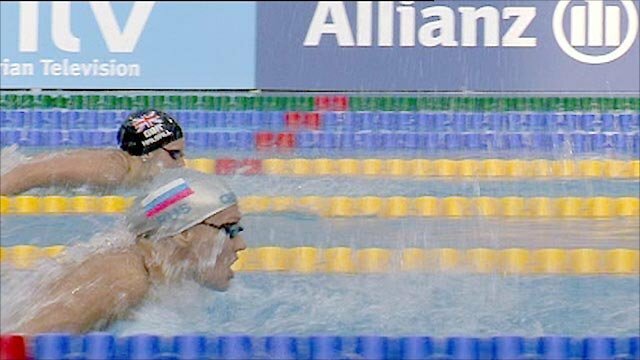 Gemma Spofforth, Fran Halsall, Kate Haywood and Amy Smith were promoted to the gold medal position in the 4x100m medley relay after one of the leading Russian quartet was adjudged to have set off too early on the final takeover, resulting in their disqualification. "We wanted to win it in our own way and I'm a little bit disappointed that we didn't," admitted Spofforth, who won individual gold and silver earlier in the week. Adlington's gold made up for her 800m slump, when she was reduced to tears during a post-race television interview. "It's better to come back here smiling than crying like I did after the 800m," said the Mansfield swimmer, reigning Olympic champion in both disciplines. "Everybody's expecting so much of me, I don't want to let people down but I let myself down when I think about everybody else who I'm letting down." 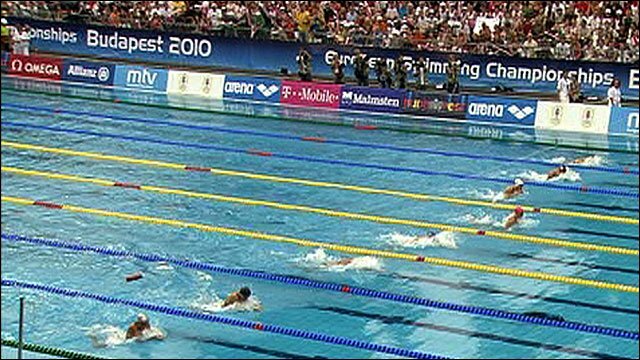 Denmark's Lotte Friis, who had claimed gold in both the 800 and 1500m free, was third behind 21-year-old Adlington. Haywood won silver in the 50m breaststroke in a personal best 31.12 seconds behind Russia's Yuliya Efimova (30.29), who completed a 50m/100m double. "I thought I was going to come here and get no medals so to get two in one session, I'm so happy," said 23-year-old Haywood, who is still not fully fit following hip surgery. Ellen Gandy was equally thrilled to claim third in the 200m butterfly final, on her 19th birthday. "I opened my cards a couple of days ago - they were in my case and I couldn't resist - but a bronze medal is an awesome present," she said. Halsall, whose individual and relay medals on Sunday took her total for the week to five, missed out on silver by a mere one-hundredth of a second to Hinkelien Schreuder of the Netherlands in the 50m freestyle final. Veteran Swede Therese Alshammar won gold. "Last time I came to the Europeans I got one medal, so to come away with five is incredible," reflected Merseysider Halsall. "It was a big challenge for me getting up and coming down again after the medals. "I can't wait to swim again at the Commonwealths now, and we'll have a good chance in this race [the 4x100m medley relay] there." The men's medley relay team of Liam Tancock, Kris Gilchrist, Antony James and Simon Burnett finished fourth, despite Germany's disqualification, in a race won by France. Burnett, meanwhile, placed eighth in the 50m freestyle.